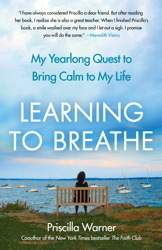 A couple of weeks ago I noticed an unusual giveaway for Priscilla Warner’s memoir LEARNING TO BREATHE. Over at the adorable Books Are My Boyfriends, blogger Kit Steinkellner announced a giveaway—but not for the book! This time, readers could win ayurvedic bath salts. Why? Because the memoir reviewed was an exploration of the healing power of meditation, and one woman’s struggle to get control of her debilitating panic attacks. The woman behind this fun twist on the book blog tour is Claire Kelley, the marketing manager for the Free Press imprint at Simon & Schuster, and the brains behind two really innovative book blog tours. She was kind enough to talk to me about the concept. And the more I hear, the more interesting it gets. Claire, what I loved about the giveaway was that it made my preconception of the book more multi-sensory. What gave you the idea to branch out this way? Claire Kelley: LEARNING TO BREATHE is a book about Priscilla Warner's search for peace and calm after years of suffering panic attacks. When I met Priscilla, she showed me a beautiful bracelet she made from tribal and vintage beads from her travels all over the world, stung together with a Buddha pendant on a Tibetan mala cord. She also had chocolate bars in her purse and offered me a bite. She's such a fun, generous and warm person, I wanted to do something for her book that would engage bloggers and introduce them to the book by luring them in with prizes that Priscilla chose (among others, a Tibetan singing bowl, a meditation lesson) to represent milestones in her journey in the book. I tried to connect Priscilla's prizes to the personality of each blog, so for Kit's hilarious blog Books Are My Boyfriends, I let her give away the bath salts. I was thinking maybe she would take some shots of herself covered in bubbles reading in the tub, but since she has to give the bath salts to you since you won (full disclosure), maybe we'll see something along those lines on your blog! Woo hoo! I’ve never really considered posting near-naked pictures of myself on the blog. I’ll have to think that one over. 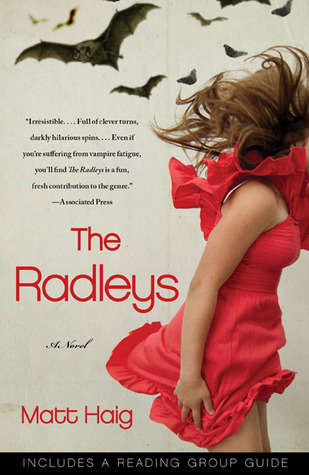 (*cough*) Moving on, I also love your quirky giveaway for copies of the YA novel THE RADLEYS by Matt Haig. These come accompanied by… blood red hot chocolate? Why? Claire Kelley: At BEA this year, I attended a book bloggers convention, and listened to some great panels about what book bloggers expect from publishers and the types of promotions and giveaways they like to participate in. I modeled this RADLEYS Blog tour after the blog tour for MOCKINGJAY, which bloggers cited as an example of a well organized tour that created a lot of buzz and was fun to follow. I chose to give away blood red hot chocolate for THE RADLEYS because I thought it was a fun fall treat and very appropriate for a book about a seemingly normal family that turns out to have vampire urges. We're in the last week of the blog tour right now, and bloggers have done a great job posting about the new cover design for the paperback, embedding the book trailer, mentioning the twitter accounts of the mother and son characters in the book @Helen_Radley and @rowanradley who in turn tweet the blog stops, doing Q&As with author Matt Haig, and linking to our quiz: Are you a Radley? It has been a lot of fun, and I hope to do more like this in the future! If any bloggers reading this would like to participate, they can enter their info here. Thank you, Claire. I'm inspired by your efforts. These ideas are so much fun. And thank you for stopping by Blurb is a Verb! —Sarah P.
It's fabulous to be able to give away good books but I think some of these more "off the beaten path" giveaways would really generate a lot of buzz! I love twists on giveaways! I try to do this whenever I have a bit of extra money.